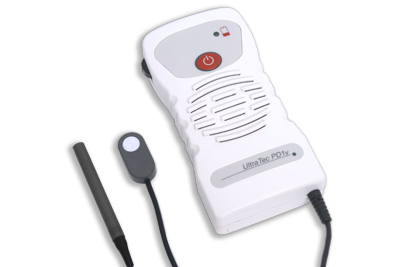 The UltraTec PD1v is a small, lightweight, high sensitivity, specialist pocket Doppler. The PD1v is available with either pencil style or flat probes ideal for use by a vascular specialist for routine vascular examinations. Vascular flow signals are easily located using the narrow beam high sensitivity pencil or flat probe while internal signal processing minimises the noise artefacts. The flow signal is available to the user via the built in loudspeaker or optional headset with output level controlled by rotary volume control. A chart recorder output is provided for the printing of non-directional waveforms. The PD1v meets all current EEC standards for medical equipment.